Ukraine is now upgraded to Category 1 from the Category 2 safety rating the country received from the FAA in June 2005. Ukraine’s civil aviation authority worked with the FAA on an action plan so that its safety oversight system fully complies with ICAO’s standards and practices. A Category 1 rating means the country’s civil aviation authority complies with ICAO standards. A Category 2 rating means a country either lacks laws or regulations necessary to oversee air carriers in accordance with minimum international standards, or that its civil aviation authority – equivalent to the FAA for aviation safety matters – is deficient in one or more areas, such as technical expertise, trained personnel, record keeping or inspection procedures. With the International Aviation Safety Assessment (IASA) Category 1 rating, Ukraine’s air carriers can add flights and service to the United States and carry the code of U.S. carriers. With the Category 2 rating, a country’s airlines are allowed to maintain existing service to the United States, but cannot establish new services. Ukraine currently does not provide service to the United States. 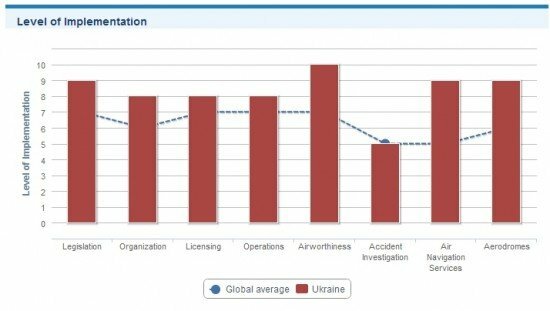 Ukraine was also audited as part of ICAO’s Universal Safety Oversight Audit Programme (USOAP). The most recent ICAO audit was accomplished in December 2011. USOAP audits focus on a State’s capability in providing safety oversight by assessing whether the State has effectively and consistently implemented the critical elements of a safety oversight system and determining the State’s level of implementation of ICAO’s safety-related Standards and Recommended Practices (SARPs) and associated procedures and guidance material. The findings of the 2011 USOAP audit showed that Ukraine’s safety level was at or above world average.